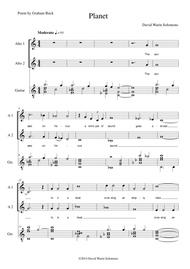 Composed by David Warin Solomons (1953-). 20th Century, Secular. Sheet Music Single. 6 pages. Published by David Warin Solomons (S0.22126). This mysterious song for two altos and guitaris a poetic vision of a nearby planet.One version relates to Venus (poem by Graham Buck inspired by Supervielle)the other version (with the same notes) relates to Mars (poem by the composer).Both poems lament the passing of an imagined civilisationon a distant planet. 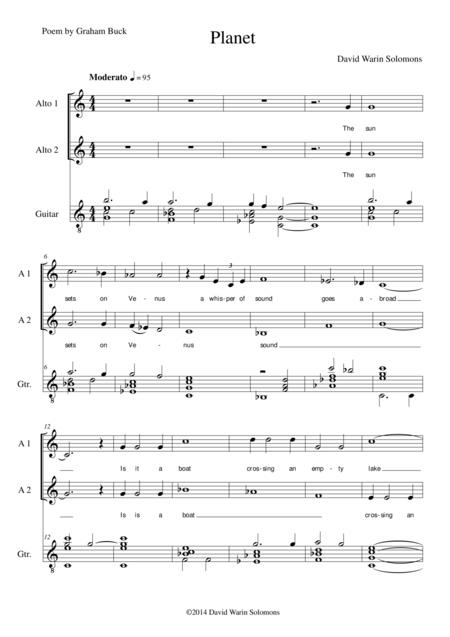 The pdf file contains the scores of both poetic versions.The sound sample is the Venus version, performed by the composer on guitar and singing first alto with Duncan Saunderson as second altoThis can also be seen as a video on youtube at:https://www.youtube.com/watch?v=F5ZxOVwjubw.